Not sure why I am at a loss about what to write about these past few days. A lot of it has to do with being very tired and after a four day stint of being a single parent, I am just now recovering. I have no idea how spouses whose husbands or wives travel, or the ultimate heroes, the single parent, do it. I tried to make the most of our time by planning activity after activity, and by Sunday, I was DONE. Fork in me done! We survived and Jeff returned to lend his always supportive hand and here we are. I took very few pictures. Oh, except for this one of Lilly on the beach. 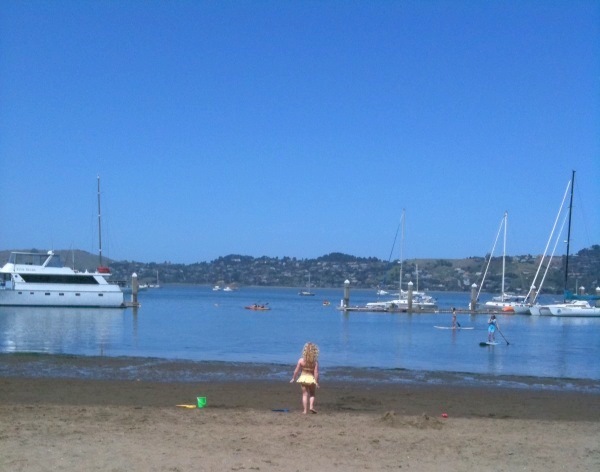 The surroundings are beautiful but it scared me to watch the beauty of my daughter, at such a young age in her little swimsuit strutting through the sand to a destination unknown. HELP! 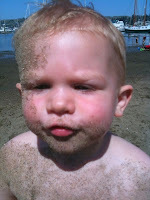 Oh and this one of James after a face plant in the sand. He found this extremely hysterical! James developed a love of baseball caps. 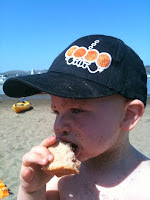 Nothing better than a jelly & sand sandwich while wearing a stolen Bus Stop hat. 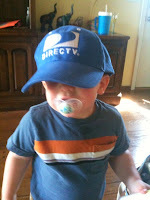 Then he donned this cap which was a gift from a great friend. He's like a walking billboard these days. 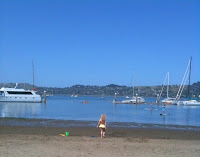 On Monday evening, I was supposed to go meet Bossy, for her San Francisco gathering of the NoBookBook Tour. I have been so excited about meeting her, and was planning to attend her event in Palo Alto on Sunday night, but with Jeff gone it just wasn't going to work. So, I waited and waited for the announcement regarding her stop in San Francisco. On Saturday I received a nice tweet saying there weren't enough people interested for a stop, so she was continuing onto Sacramento. I completely understood, I mean she is driving like 60,000 miles in six weeks, leaving behind a family and a life to go meet all the crazy blogger people around the country. I got, I did. She didn't want to waste a night just hanging out with me while I asked her questions about her drive and comparing our John Cusack obsessions. I mean, really, how much fun would that be? But still, I was so sad. Kind of hurt for a minute, but then I realized, it wasn't me. I wasn't in high school anymore. Like that time in eleventh grade at this particular school where I didn't fit in but someone thought to invite me to a party and then I was uninvited. It wasn't like that at all. Nope, it didn't feel like that. Not even close. I realize that in this huge world of bloggers; mom bloggers, food bloggers, satirical bloggers and every other blogger on the planet, I may not have a place. Goodness, I don't have the energy for my regular life, much less taking the time to expel some of it in an arena where I get my feelings hurt. I am almost forty. I am the mother of two. I am a wife. I am a writer. I am salesperson. Not one of these define me, they all do. There is one more issue I must address. Remember, the case of the hot feet? It dawned on me about twenty minutes ago that I had the boots on again, and I was uncomfortable and kind of grumpy due to this sweating problem. I must get some rain boots. This is unacceptable and has to end. she's back! she's back! how great it is - love the blog, love the pictures. James' hats are great - we have several we can donate to add to his collection. Glad to know you got your mind around the blogger's nonstop in SF. Keep blogging - love it! Would have loved to hang out with you and all our kids this weekend! I knew you were alone but I was away too. Beach looks great, which one is that? As for the blog, I love it and think you could make a go of it but you could also just do it and think of it more as a journal for yourself and family to take the pressure off. Better idea ... keep the boots and let the rain go away!